Oils: patchouli, vetiver, black spruce, carrot, cedar-wood, juniper, spikenard, angelica, pine, cinnamon, frankincense, in almond oil base. The root energy center is one of the most affected centers in our western world, as we put so much pressure and stress on our physical system, to survive, to eat, to live, to stay healthy. We are in a constant rush, and if that wasn’t enough, we’re adrenaline junkies, diving off mountains, building, planes, seeking adventure on vacation. We are a non-stop, go-go-go society. This oil synergy contains all the frequencies to support the root chakra, associated with all of our ways of dealing with the material world. Supporting our adrenal system, this vital center deals with our stress, our adrenal glands, our kidneys, our serineal glands, and our base of our spine. It’s connected to our structure. It’s about our roots, our ancestral genetic lineage, and energetically we all have memories of survival. Transforming this memory into one of abundance is our collective and personal work. This consciousness center, the root chakra, is all about learning how to trust the universe, that we have a place within the universe and that we are taken care of physically when we learn to let go and open up. When we start being present rather than searching for the adrenaline rush, we learn stillness and trust naturally arises. Trusting the cosmos, trusting ourselves, trusting our bodies, trusting nature, and trusting this planet. Anchoring into our body, into the moment, taking tasks one by one, creating boundaries, and realizing the connection to our body’s intelligence. 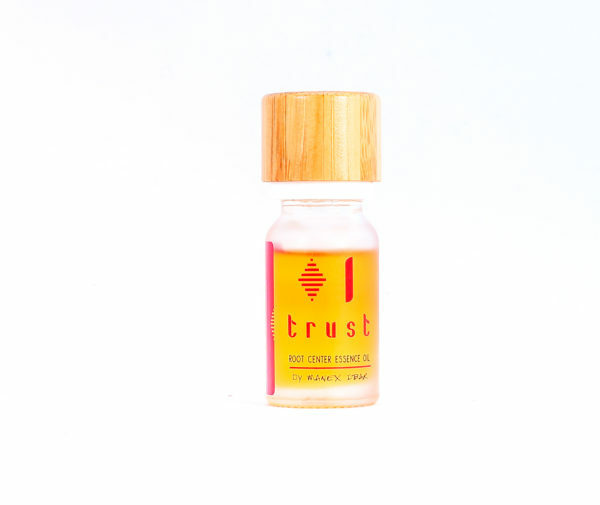 Trust – a unique synergetic essence oil to help you ground and feel secure in the world’s constant changes. Find a quiet place, sit and relax. Take 1 drop of this oil and put it on your wrists, 1 drop on the bottom of your spine, defuse it in the room, and then take 3 deep breaths while inhaling the oil from your hands. Close your eyes and imagine a ball of red light in between your hips. Make it piercing red light. Feel it grow, expand, and lighten up. Play with this ball of light, turn it, clean it and feel it. Let your body expand, feel your breaths in harmony with your heart beat, feel your breath expanding your cells in your body as they open up to the cosmos. Feel this red light expand down through your feet, expand down through the floors, into the earth and like a tree rooting deep into the earth, your red energy creates roots down all the way through to the center of the earth where it meets the internal fire. The earth welcomes you, and sends you a blast of fresh powerful energy to tune your body, cells, and bones to your unique frequency.